Industry Experts released the 2017 version of its European market report on Ventilation Equipment titled ‘Ventilation Equipment – A European Market Overview’. As per the new report, Germany estimated the largest producer of ventilation equipment with 13.7 million units in 2017 while Italy follows with 5.4 million units. In terms of Fan type, Axial Fans accounts for 8.5 million units followed by Range Hoods and Domestic Exhaust Fans with 6.7 million units and 5.9 million units respectively in the same year. Driven by stringent regulations introduced by the European Union to reduce energy consumption in buildings, the European ventilation industry is expected to benefit from the increasing demand for energy efficient ventilation products. Modest but steady growth in construction activity in the residential and commercial sectors would enhance demand for ventilation equipment. Other factors, such as awareness about importance of indoor air quality would go a long way in renewing market demand. 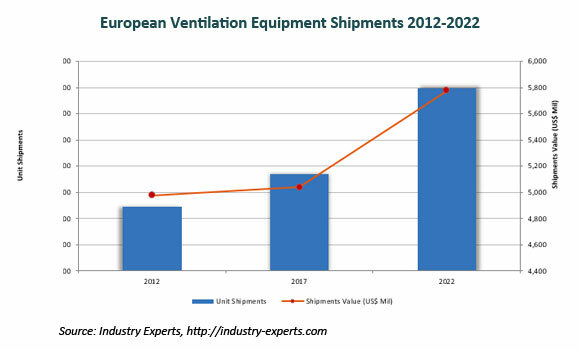 Overall outlook for shipments of ventilation equipment in Europe is expected to be picking up, although at a moderate pace. European shipments value of ventilation equipment is forecast to reach US$5 billion in 2017, from an estimated US$4.98 billion in 2012, further projected to reach above US$5.8 billion by 2022 registering a CAGR of 2.8% during 2017-2022 period. The report analyzes the European ventilation equipment shipments covering all of the 27 European Union countries with special focus on Czech Republic, Denmark, France, Germany, Italy, the Netherlands, Poland, Portugal, Spain, Sweden and the United Kingdom. Ventilation product segments analyzed in this study include Axial Fans, Centrifugal Fans, Cross Flow Fans, Domestic Exhaust Fans, Roof/Box Fans, Range Hoods and Air Handling Units (AHUs) for Ventilation. The study includes 101 charts (includes a data table and graphical representation for each chart), supported with meaningful and easy to understand graphical presentation, of shipments. The statistical tables represent the data for the Ventilation equipment shipments value and unit shipments by geographic region and product segment. This report profiles 25 major market players and 47 other key players that are engaged in ventilation equipment production in Europe. The research also provides the listing of the companies engaged in the production of ventilation equipment in Europe. The list of companies covers the address, contact details and the website addresses of 287 companies.